The system utilizes a process called InnerDialogue–a neurokinetic feedback mechanism combined with mudras, a gesture based language–to augment and facilitate change. This series, in three parts, explores a process-oriented form of neurosomatic feedback to augment the understanding of the disharmony and imbalance of the nature and flow of qi / chi. It uses a particular process to allow the client to reveal their own story: the ontology of the imbalance of the rhythm of qi. The process also reveals the remedying action that reroutes, augments and initiates changes in the dynamic of the rhythm and movement of qi. The work incorporates core Taoist teaching, the cyclical nature of the Tao, and maintains a central tenet that the human emerges from earth, sits squarely between the heavens and earth, and is guided by the Celestial forces. The human template model presupposes a singular and fundamental Source (Tianqi) that facilitates human balance, harmony and development between earth and heaven. This is both a hierarchical relationship (vertical) and horizontal– cyclical and interactive. Qi–in a rhythm is a unique synthesis of east meets west. This is a new approach using a sophisticated neurokinetic feedback protocol [muscle testing] with a gesture driven language–hand modes, or mudras–called InnerDialogue™. Using this protocol you will begin to have a very detailed understanding of the forces and elements, both internal and external, which have contributed to the dysfunction of the organism.. The work elegantly helps you to hear the client’s story and brings forth their own display of points to facilitate deep and profound changes in the organism using the meridian systems. This ontological approach allows for a far deeper understanding of the complex inter-relationships of the human being and the natural flow of energy within the body and also, as reflected in the model of Chinese Medicine, in the natural world, the ancestors, and the heavens. This two-day workshop is designed for both absolute beginners in Chinese Medicine and also for practitioners. We will amplify and weave together an introduction to the core concepts of Chinese Medicine with a dynamic model of the Life Forces, augmented by the dialogue system provided by both kinesiology and hand modes. Use of this sophisticated protolanguage will enable precise access to meridians on display, the points that are in dysfunction, and the dialogue (and reasons) behind it. This in turn will facilitate deep internal change, resumption of a harmonious flow, and improved well being. This workshop will prepare the person for the following two modules which will go much deeper into the work. This four day workshop will expand upon the foundations laid in Module One, weaving together expanded core concepts of Chinese Medicine with a much broader palette of hand modes, thereby providing a deep and wide [root and branch] understanding of the factors that influence the flow, balance, and maintenance of Qi. Use of this sophisticated protolanguage will enable precise access to meridians on display, the points that are in dysfunction, and the dialogue or reasons behind it. This in turn will facilitate deep internal change, resumption of a harmonious flow, and improved well being. This workshop will prepare the person for the final module, which will delve into the quintessential elements of archetypes involved in the dynamic of Qi. Part 3 utilizes the extraordinary flexibility of the work and its inherent dialogue. 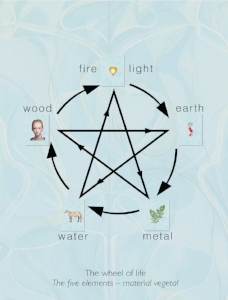 InnerDialogue™ allows us to look at the archetypal elements that influence the human being; whether elements of the earth [the 5 elements], or of the vegetative kingdom or biosphere – such as the 5 climatic factors or archetypal elements of the animal, human and celestral kingdoms. It allows you, the practitioner, to listen to the underlying patterns of display, and see how the body actually displays the patterns of dysfunction through the meridian system. This part of the work provides you with comprehensive maps of display to facilitate a greater or more immediate therapuetic input when required. It will deepen your knowledge base, allow for a precise diagnostic understanding as to the elements that have disrupted the flow and movement of qi, and will provide a recognition of the movement of pernicious and pathogenic qi into the system, and why each individual’s unique nature, actually demands a precise tailor-made approach rather than perhaps, a formulaic mode of therapy.